Monday again, already! Anyone else have a problem with their clock and the days going by quicker? I know we all get the same 24 hours it just seems like there aren’t enough hours in my day lately. Quick and easy healthy meals are where it’s at most nights. 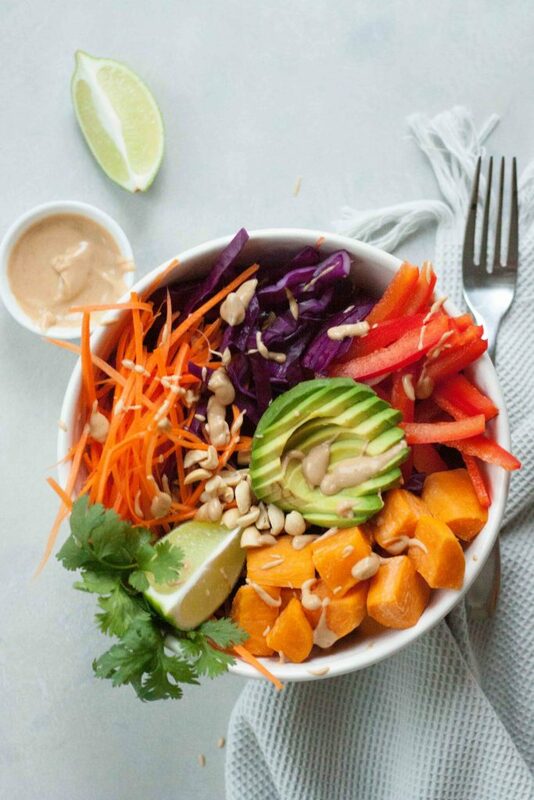 It doesn’t have to be hard and this Sweet Potato Pad Thai Bowl is easy to make and packed with flavor and nutrition! I’m almost lost at where to start with this bowl but we love it. In the past we’ve made Sweet Potato (or Yam) Noodles with Spicy Peanut Sauce, Thai Sweet Potato Nachos, (both VERY old posts) and other things but keeping it simple and easy. We always have sweet potatoes, red bell peppers, carrots, and avocado in the house. I will eat sweet potatoes anytime of day and it’s one of S’s (my oldest daughter’s) favs. Red bell peppers are one of A’s (my youngest daughter) favorite veggies. Carrots are a staple veggie that always needs to be in the fridge for lunches and snacks. Avocados 3 out of 4 of us love them and you always need to have them on hand for avocado toast and taco nights! Peanuts are pretty much always in the cupboard and of course lots and lots of peanut butter, we have a whole cupboard of nut butters. So when we have lots of cabbage to use up from the garden, along with peppers out there and cilantro this is on repeat. It can easily be prepped ahead too and thrown together in minutes. Adjust the spice level to suite your taste, this always hits the spot! Throw an egg on or leave it off it all depends on the mood and who’s eating it in our house but the option is yours. Like I said we have a lot of peanut butter. In our house there are 2 peanut butter lovers and the other 2 like it just don’t “crave it”. If your kids like peanut butter this is how you can get them to eat more veggies, just saying. Pretty much haven’t found anything that is better with peanut butter. This bowl is packed with so many veggies it’s a great way to justify eating more peanut butter, not that I ever need a reason but I’m always looking for new ways to enjoy it besides straight from the jar. If you want to tell me you aren’t a fan of salad hey I’ll tell you the best one that includes only 4 ingredients, one being peanut butter, that you’ll love. Yep some loves run deep and peanut butter is one of them. 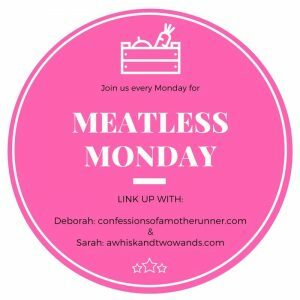 Monday, yes Monday, so that means Meatless Monday. My co-host, Deborah, and I look forward to seeing what you’re eating on this fabulous fall Monday! Tell us below, link up and share a favorite, either way I hope you’re inspired by this recipe and one (hopefully more) linked up below! Happy Monday! Delicious and easy to make Sweet Potato Pad Thai Bowls are packed with flavor and nutrition! Gluten free and vegan friendly with optional egg addition it's a great weeknight, or any night, meal! Preheat oven to 400F. Line a rimmed baking sheet with foil and spray with coconut oil spray, or oil of choice. Peel sweet potato and chop into cubes about the size of dice. Spread squash cubes on prepared baking sheet and spray with coconut oil spray. Alternatively you can toss squash with 1-2 teaspoons of coconut oil. Roast for 20-25 minutes, tossing/flipping once half way, until tender. While the sweet potatoes are roasting prep other vegetables if they are not already prepped, shred carrots and peppers. If you are serving with an egg cook your eggs. In a saucepan whisk together peanut butters, coconut milk, sugar, and aminos over medium heat until it is smooth and comes together. Reduce heat just to keep warm. When sweet potatoes are done remove from the oven and assemble your bowls. 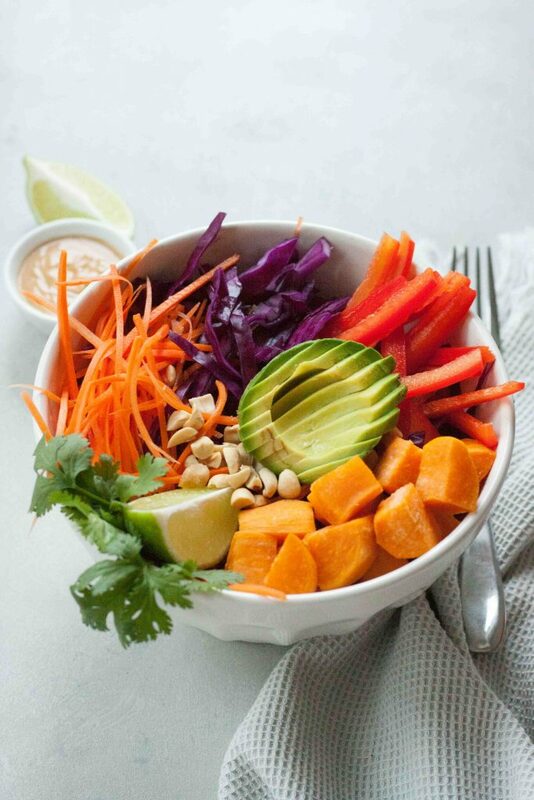 Arrange shredded cabbage, carrots, peppers and sweet potatoes in a bowl. Cut your avocados in half and slice. 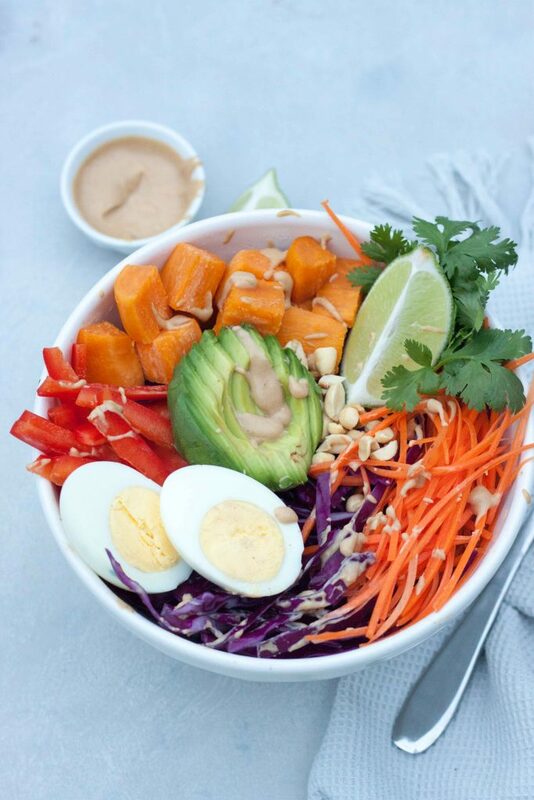 Top bowls with avocado slices, peanuts, cilantro and optional egg if adding. Serve with a lime wedge and Pad Thai Sauce. Alternatively Pad Thai Sauce can be drizzled on before adding avocado, peanuts, and cilantro. For a less spicy sauce, for kids we do a 3:1 ratio of regular to spicy peanut butter. If you don't have spicy peanut butter you can add a little red chili sauce or red chili peppers. Like it, pin it for later (two options)! Oh my goodness gracious, I need this in my life! This looks incredible! Love all those veggies and that sauce. Thanks for hosting! This is so colorful and the flavors are amazing. I doubt my kids would go for it but my husband and I sure would!! Just coming from Taylor’s cookie stuffed blondie recipe I feel like if I make this too, I can totally justify eating a few too many treats. This looks amazing, so bright and beautiful!! This looks perfect for Meatless Monday! So healthy and delicious! Pad Thai is one of my FAVES! Add sweet potatoes? Oh I’m soooooo in! Love this! I am going to try to find the spicy PB- never even heard of it! This looks so good! Love all the fresh flavors in this dish! I am printing this out as I type this! I can’t wait to try it! My hubby is going to eat this up! I’ll let you know how it turns out! May tag you in a pic on instagram! We’re a peanut butter obsessed household as well! This is such a great way to get kids to eat their veggies. And adults too, I suppose – I mean, I’ll eat anything peanut butter on it! 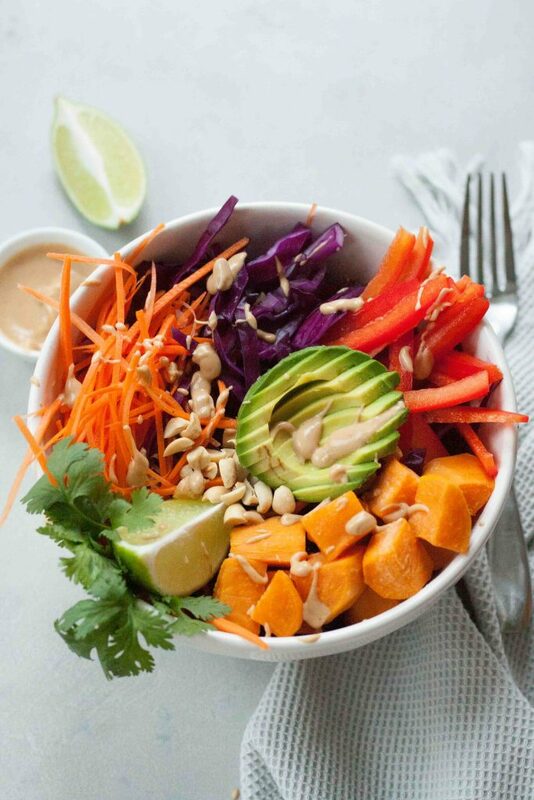 I wouldn’t have thought to put sweet potato in a thai bowl — now I’m craving it! Looks delish! This is a great example of eating a rainbow. I love the way the flavors and colors work together. This bowl looks amazing (that avocado is perfect!) Luckily I usually keep almost all of these ingredients in the house soon, I can’t wait to make this! I love how healthy and fresh this is! They make spicy peanut butter? That’s such a great idea. You have combined two of my favorite foods into one happy bowl. I can’t wait to try this take on pad thai! Beautiful and delicious! I love peanut butter, too, and all kinds of peanut sauces. Yum! This looks incredible and would love to try this. In fact, I am going out today to grab some ingredients. I am trying to consume more fruits and vegetables and I think this would be perfect.